It was a kaleidoscope of glitz, glamour, fashion statements, and entertainment panache, last weekend, as entertainers, socialites and celebrities from across Africa stormed Lagos for the fourth edition of the All Africa Music Awards, AFRIMA, which held at the Convention Centre of Eko Hotels and Suites, Victoria Island, Lagos. For guests who graced the epoch making event, it will be a night that will hardly be forgotten any time soon as their favourite entertainers dazzled both on the red carpet and on stage. 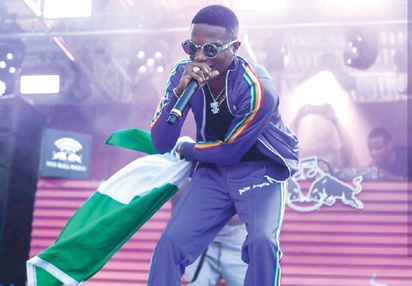 Wizkid, who has been constantly nominated in the same category with Davido, went home with three most coveted awards, Best West African Artiste award, Song of the Year and Artiste of the year, defeating Davido, Runtown, Tekno and others, who were nominated in the same category. Velvety voiced singer, Simi, got the award for African Writer of the year, Tiwa Savage clinched Best African Act Award, (female), Ycee smiled home with the award for Best Artiste or group in African Hip-hop, Orezi bagged the award for Video of the Year, 2Baba was also honoured for Best Artist or Group in African Reggae & Dancehall, among many others. The AFRIMA legendary award went to Mali’s Salif Keita and Zimbabwe’s Oliver Mutikudzi.